Over the past decade, microarray-based high-throughput gene expression analysis has been employed in an effort to understand the molecular alterations involved in tumorigenesis and disease progression in melanoma. A gene expression array is a small glass-platform containing tens of thousands of sequences corresponding to specific mRNA transcripts. The most recent generation of microarray platforms are able to probe gene expression across the whole genome (Figs 7.1 and 7.2). These are generally applied to either (1) distinct classes of samples (i.e., primary melanoma and melanoma metastasis) in order to identify genes with class-specific expression patterns or (2) apparently unrelated samples to discover previously unknown classes that are characterized by similar expression profiles. If clinical follow-up is available, gene expression signatures may provide new prognostic markers. DermTech International. 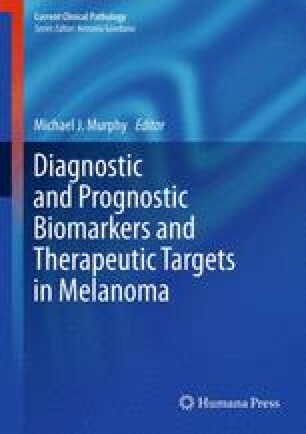 Available at http://dermtech.com/technology/melanoma-detection/index.php. Accessed 2 Sept 2010.